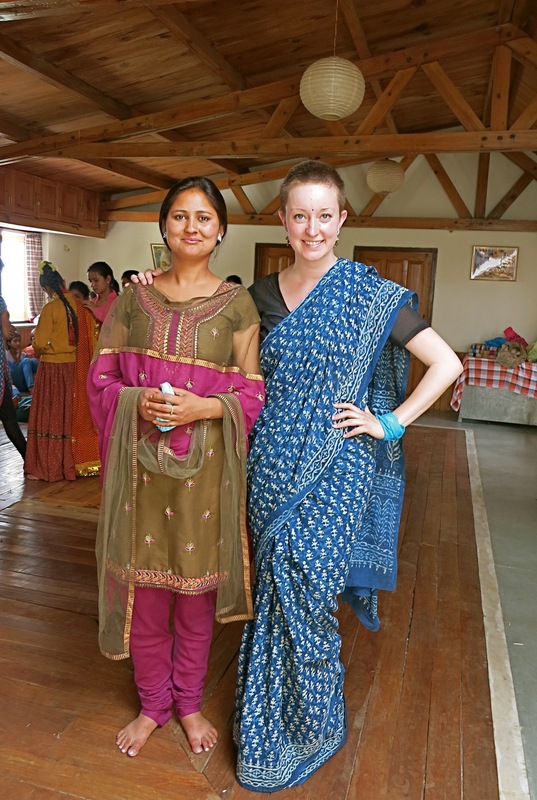 I write this not so much to brag (although that too a little bit), but for future volunteers who will wonder, as I did, what life will be like working for an organization in India. My place, at a grassroots non-profit called Aarohi, located in a tiny village in a rural part of Uttarakhand, is so wonderful. Every day I try to take the time to feel grateful for my beautiful surroundings, my almost resort-like accommodation, and my welcoming and caring coworkers and new friends. My role here is to write an analytical report on the education system at the local school, and make some contributions to fundraising and reporting more generally. To establish this end, I work at the school a couple times a week, teaching English and doing some simple theatre, getting to know the children and the teachers. Although I knew that this organization was very small, less than 100 permanent staff all together, I never would have anticipated the friendly relationship I have with the people at the very top. There are two doctors that essentially manage the health sector, one of whom is an original founder of entire the organization, that have more or less taken me under their wing. I’m routinely invited over for dinner and given guidance on my projects to make the most of my time here. Not only that though, but on a personal level, it’s like I’m consistently being given back the same respect I feel for them. They ask me for my input and listen sincerely. We discuss the workings of organization as a whole and my thoughts on their own projects, and then they take the time to teach me things that are unrelated to my mandate but that will be incredibly useful to my disciplinary studies as well as my understanding of culture, development, and NGOs. In addition to these colleagues on site, I have a mentor who calls from London every week to keep up with my projects, and has a magical way of completely understanding every topic I bring up with her. She makes me feel like I’ve been productive and insightful just by being aware of my surroundings and thinking carefully about them. Everyone else is so lovely too. Any person who passes me along the path or around the shops will bring their hands to their chest and say Namasde, smiling excitedly when I say it back. The lady who cooks for us everyday pinches my cheeks and remembers to make my chai without milk. The groundskeeper (who claims to be the oldest man at Aarohi) takes time every morning to teach us new Hindi words even though his English is slightly stuttered. The teachers at the school greet me and invite me into their classrooms, while the principal stands back with a look of great appreciation for the workshops put on my volunteers. The children grab onto my hands as I leave and shout “Becca bye! Becca bye!! !” Then the dance teacher ushers me in to watch every practice, something I love. My roommate is a certified yoga teacher who will put me through a series of poses at the slight suggestion that I’d like to stretch out a certain part of my body. I go home every day with a bag stuffed full of peaches and apricots given to us by the generous strangers who grow them. But the upsides of volunteering here aren’t just work-based. I’ve been included in many personal and cultural activities as well. The major highlights included a traditional Kumaoni dance, for which I was dressed and made up accordingly, and my new dance moves were performed (along with nine others) for a crowd of several hundred local people. I’ve had the opportunity to travel to a nearby tourist town for the weekend, where I had access to the few luxuries I’ve been missing in the hills — such as restaurant food and big markets for shopping. Finally and most recently I had a day filled with music, bright colours and fabrics, and tons of delicious food when I attended the wedding of a friend’s brother. The celebrations carried on for so long that it wasn’t possible to stay the whole way through without going home to sleep. I feel so lucky to have had these once-in-a-lifetime cultural opportunities that wouldn’t have been offered to me if I was just passing through the area rather than staying slightly longer term. As if it’s not enough to be involved in such a vibrant community, surrounded by the beautiful forested, rolling hills leading into the Himalayas; the guest house I’ve been given to stay in is incredible. I have my own large room, with a bed made up of two single mattresses. I have a kitchen and bathroom that I share with only one roommate. I have a balcony with a view of the hills where I sit and read, or eat meals of fresh fruit and vegetables. This really is the life, in a country where the custom is to work at your own pace, I have nothing I could justifiably complain about in regards to my placement here so far. Very proud of you woman!! Also, Sheeba’s presence does add a special touch to volunteer placements! Am equally impressed by the way she remains connected to all of us and our work. Enjoy this period while you have it and you can contribute and also experience a lot during this short time in rural Kumaon.